Things have been so optimistic in the ballet world in recent years, that we can now reasonably expect to see good stuff on a New York City Ballet slate with four new works, even if three of them were generated with an eye toward the fashion angle of the season's gala. Corps dancer Troy Schumacher (read Marina Harss' New York Times piece here) was finally invited to set a piece—Clearing Dawn—for his employer after giving it quite a successful go independently; his troupe, BalletCollective, with a focus on cross-genre collaboration, gives performances soon. Thom Browne's crisp grey and white prep school costumes—revealed after massive overcoats flew from the dancers' shoulders, to return at the end—set the schoolyard recess tone, replete with a game of tag, fisticuffs, make up hugs, contests, adrenalized romps, and the subsequent onset of fatigue. Judd Greenstein's score, laced through with coursing runs and fluttering flutes, complemented the interplay. Expect Schumacher to make more work for NYCB. In a short time, Justin Peck has become the go-to guy for reliably good dances. Belles-Lettres, to César Franck, with warm-hued, oddly-mixed costumes by Mary Katrantzou, is a more serious dance than many of his previous ones, with less bright gaiety and fewer visual winks. It implements the geometries that have distinguished Peck's work, placing Anthony Huxley as the lone man/poet among four couples whose darting, hummingbird movements frequently follow the fleeting piano line played by Susan Walters. The predominant form is the couple, and the news is unusual pairings: Lauren Lovette with Jared Angle (nice to see him partnering a woman proportionate in size), Ashley Laracey and Adrian Danchig-Waring, Brittany Pollack with the exuberant Taylor Stanley, and Rebecca Krohn with Tyler Angle, both alabaster cool. The first part, with its darker lighting and minor-key mood, ends after Huxley's big solo; the light turns to gold, the music morphs into a major key. It showcased Huxley's rapidograph style, but the reliance on the traditional couple felt like a minor regression from Peck's inclusionary groups. The big attraction was Alexei Ratmansky's Pictures at an Exhibition, to Mussgorsky's suite. 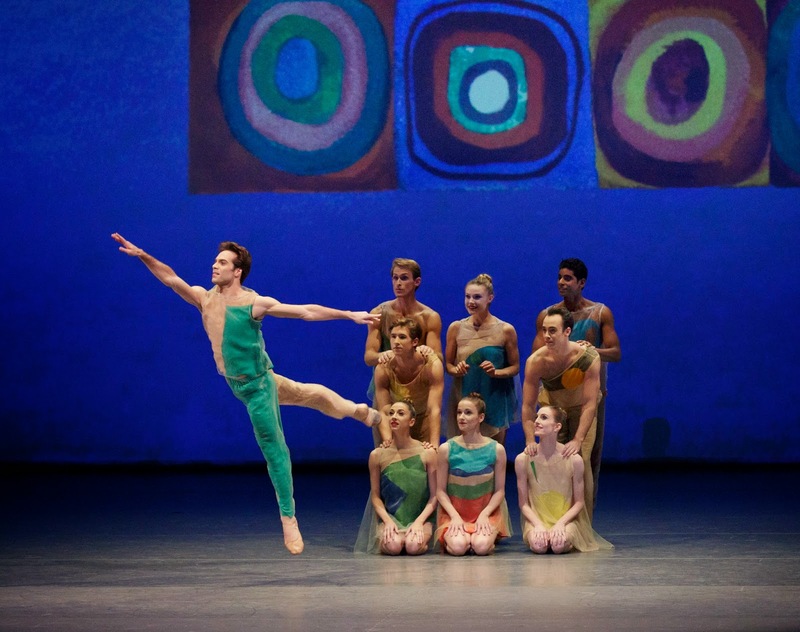 As in past works by the choreographer, the sets—Kandinsky's Color Study Square parsed and tweaked in Wendall Harrington's projections—root the work in a Russian context without affecting the narrative. The 16 sections, often connected in smooth segues, feature groups and solos. Sara Mearns, mercurial, whipped out arabesque turns and slammed her palms on the stage. Wendy Whelan and Tyler Angle partnered, dancing to a pulsing melody, at moments evoking other duets which this frequent pairing danced, including a ship prow lift (Wheeldon's After the Rain) made more difficult with her feet on his torso instead of his thighs. The pair had earlier in the evening danced Wheeldon's This Bitter Earth, again made even more eloquent by virtue of Whelan's impending departure. Four women who stomped inelegantly (and refreshingly) and windmilled their arms banded together in a gang. Underutilized principal Gonzalo Garcia was prominently featured in a duet with Tiler Peck; fairly matched physically, they often danced in unison. The similarly overlooked Abi Stafford paired with corps member Joseph Gordon, with Gretchen Smith, emergent from the corps. Because of Whelan's impending retirement, I kept wanting to read into the actions that revolved around her, including a moment when she knelt to scoop up some invisible thing on the ground as the company gathered around. As she was borne away by Amar Ramasar, Tyler Angle reached for her yearningly, looking bereft. After a false ensemble ending (another Ratmansky signature, seemingly), the company rushed downstage, the womens' movements—lifts with blossoming arms—punctuated the music like fireworks. It was a gleeful ending to another major, varied ballet by Ratmansky, now choreographing for both of New York's big companies, to our benefit. I should add that the bill opened with Peter Martins' Morgen, a 2001 work to Strauss recostumed by Carolina Herrera. The set's gigantic columns, ostensibly meant to add classiness and provide places for the dancers to hide and mischievously emerge from, merely overwhelmed the dancers and made it difficult to light the stage adequately. All three women partnered with all three men, a disheartening fact once realized partway through the piece. Martins' fondness for complicated partnering, including a lot from the "baggage handler" school, and overly fussy steps that can vex these fine dancers, were in full view. The long evening would have been the perfect length without this piece, and Herrera's gowns could have been displayed in the lobby.